Fishing nearshore has been excellent this week. Mahi, Kingfish, Snapper, & cobia are lingering around schools of baitfish. Lots of greenies are along local beaches, which is a good sign for fishing nearshore. Cobia, kingfish, mahi are all holding around nearshore wrecks this week. Snappers are on nearshore reefs. Bottom fishing with cut bait is a sure fire way to bring a few home to the fryer. Tarpon & permit are roaming the beaches too. Freelining crabs or greenies will give you ample opportunity to catch a few of these prized fish along the beach & on local nearshore wrecks. 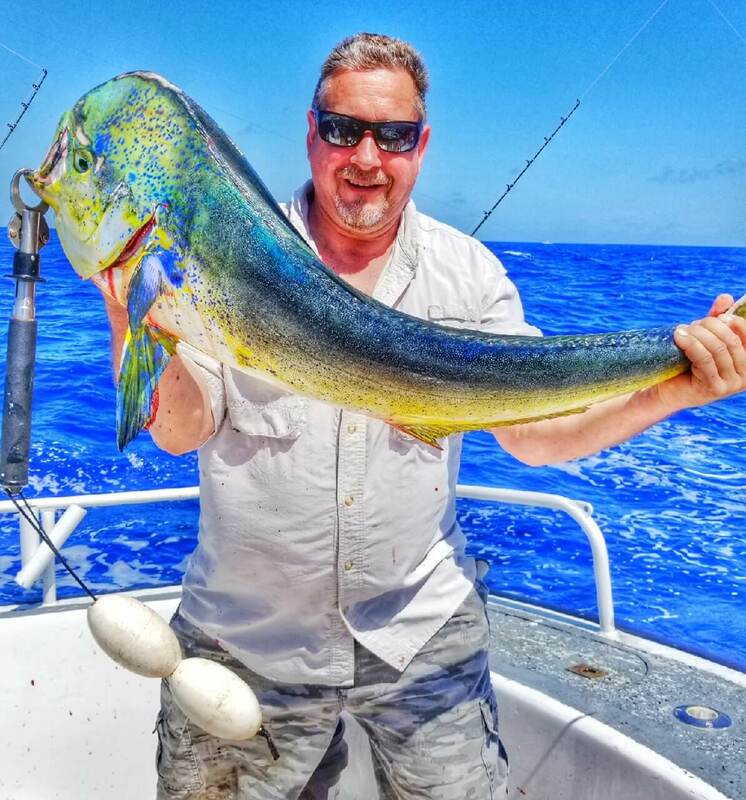 Mahi fishing remains strong in 1500′. 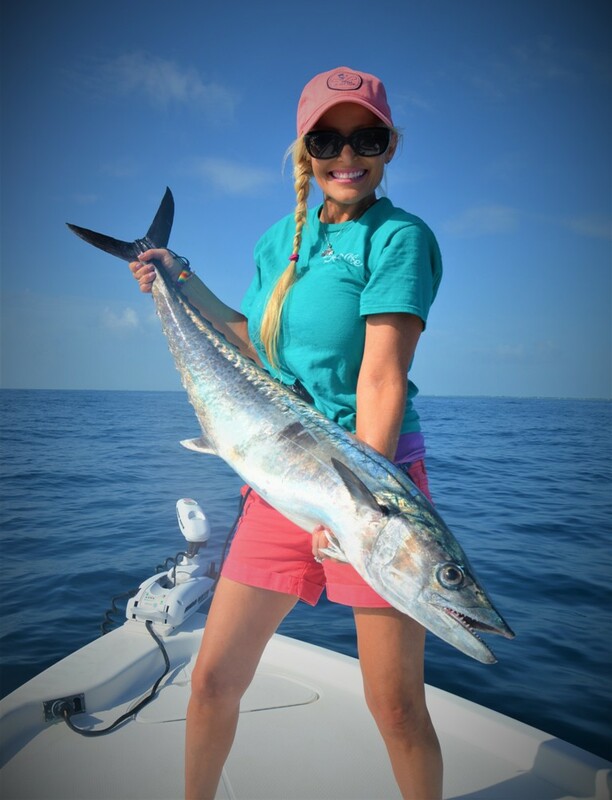 Trolling inshore in 150-300′ you can expect plenty of bonita, sails, kingfish, & blackfin tuna. Smaller tuna are holding good in 300′. Bottom fishing remains steady for snapper, grouper, seabass, triggerfish, & porgies. Bottom fishing 70-180′ should produce a variety of species. Keep a cobia jig onboard as well. A few have been roaming in 70-90′ over the past few days on the 6 & 8 mile reef system. 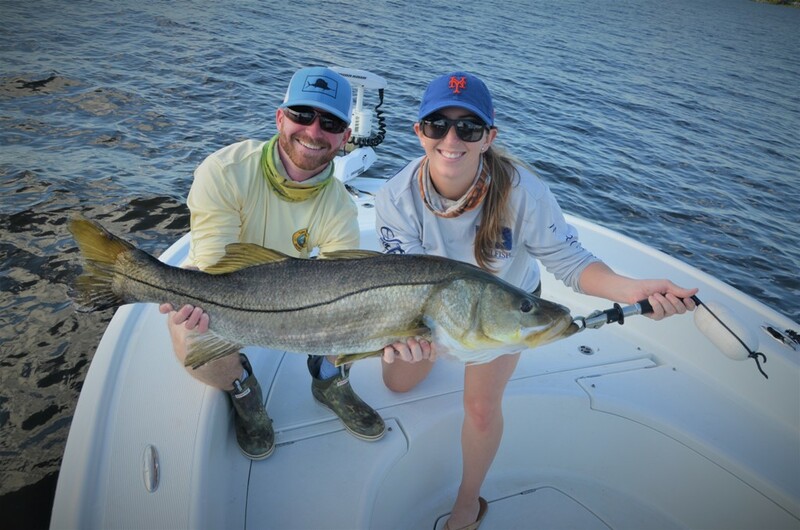 Fishing this week we can expect to catch lots of snook & tarpon locally near & around our St. Lucie Inlet. Remember, snook season is now closed and will remain closed until September. 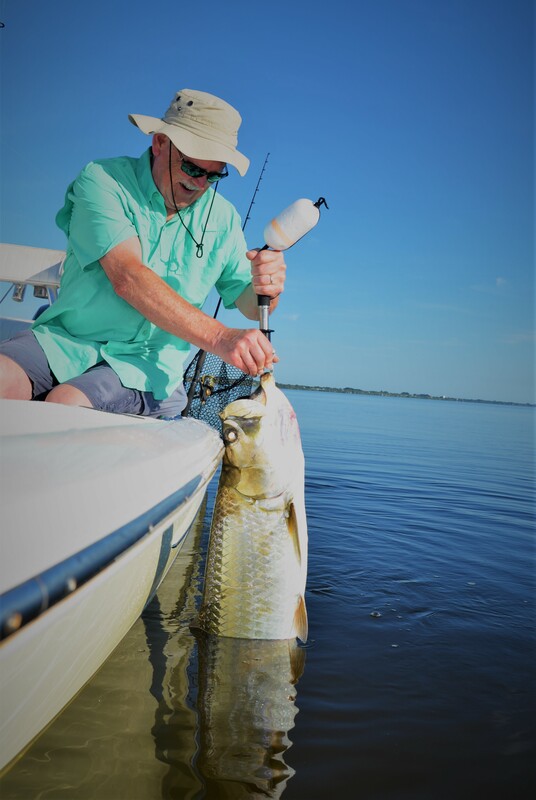 Harvest prohibited, but none the less fishing live baits is a great way to ensure a successful day on the water for snook & tarpon during summer months. Fish near or around structure for snook. Tarpon tend to hang out further away from structure in open bays, channels, river bends, etc. I typically suggest fishing mullet or crabs for tarpon & sardines, pilchards, & or greenies for snook this month. Bottom fishing for flounder, snapper, croaker, sheepshead is a good option if you just feel like tossing some shrimp out on the bottom, you should catch a few of these species. Fishing nearshore has been tough this week. We still have cold water lingering around but it also means more snapper will be closer to shore. They will take more convincing to get a bite but they will be larger on average. Bigger vermillion snapper have been in good numbers in 55′ of water around structure. Also mixed in are mutton, mangrove, lane, & even red snappers this week. Cobia fishing has been hit or miss. Dirty water has made sight fishing very difficult at best. Goliath groupers are starting to show up around local nearshore wrecks as well. Some tarpon can be found along the beach throughout the day along with jacks & permit. Again cold water has made fishing somewhat difficult this week when fishing offshore. Strong currents should remain for a few more days then slow down to a fishable pace. Trolling has been fair for mahi, tuna, & sailfish lately. Mahi are ranging in depths from 180- 350′ & 700-1100′, tunas in 300-500′, & sailfish in 70-180′. 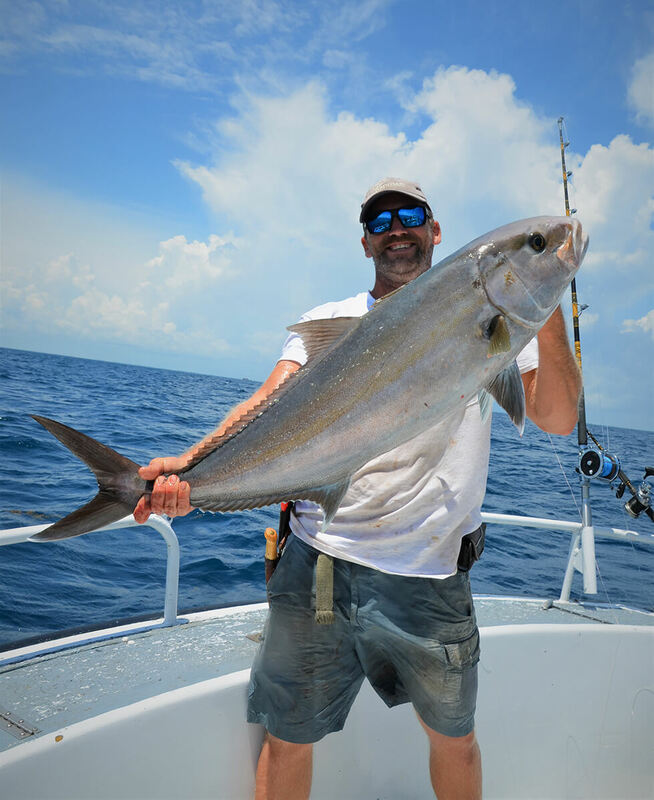 Bottom fishing has been decent for amberjacks, grouper, larger vermillion, mutton, & mangrove snappers. Live & dead cut bait have been your best bet with a fish finder rig and ample weight to hold on the bottom. Snook fishing will be our main focus this week. Bait fishing will be your best bet around local bridges & structure. Sheepshead, black drum, flounder, triple tail are all still readily available when fishing shrimp in our very own beautiful Indian river. Big jacks are also cruising local seawalls so use heavy tackle with larger baits to target trophy sized fish this time of year. Pompano fishing has been hit or miss around the st lucie inlet when fishing bottom rigs or jigging the flats. 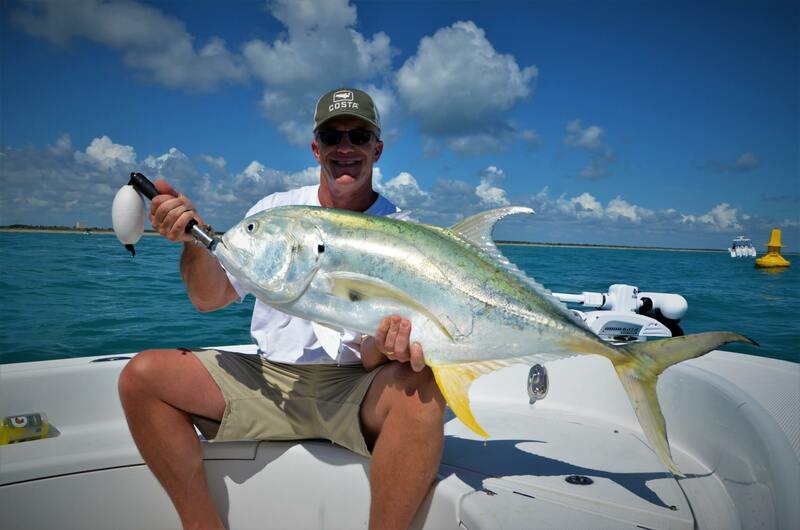 bring a few extra jigs due to heavy concentrations of bluefish, ladyfish, & spanish mackerel. Fishing nearshore this week our main focus will be cobia, snapper, & mackerel. 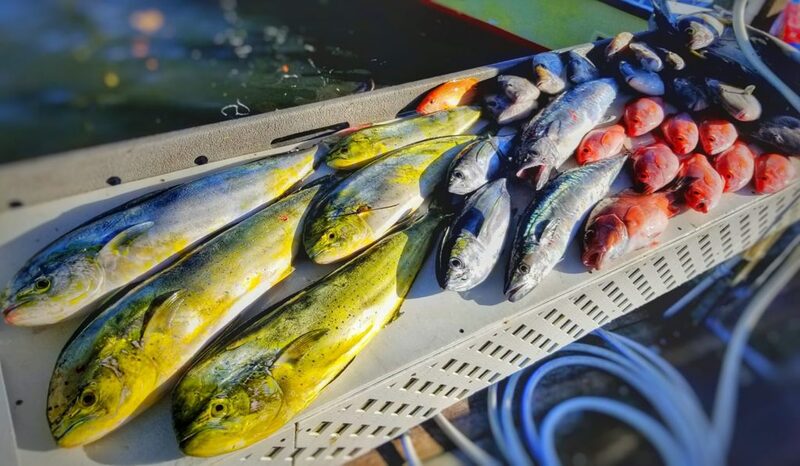 Nearshore wrecks an reefs are a sure fire way to fill the fish box during the month of March. Bottom fishing with cut bait will catch a variety of snappers this time of year. Jigging with 1-3 oz cobia jigs is an excellent way to catch a larger tastier fish for the frying pan. Spanish mackerel fishing remains strong down at pecks lake. Sheepshead are around local reefs so drop some live shrimp down for steady action! This week lots of boats are reporting good action on blackfin tuna about 10 miles offshore. Mahis are mixed in and also can be found along current edges & weedlines anywhere from 90′-400′. Trolling small feathers will yield steady action on tuna, mahi, & bonitas. Trolling ballyhoo will give you a better shot at larger Mahis & sailfish. Most action has been from 160-200′ of water over the past few days. 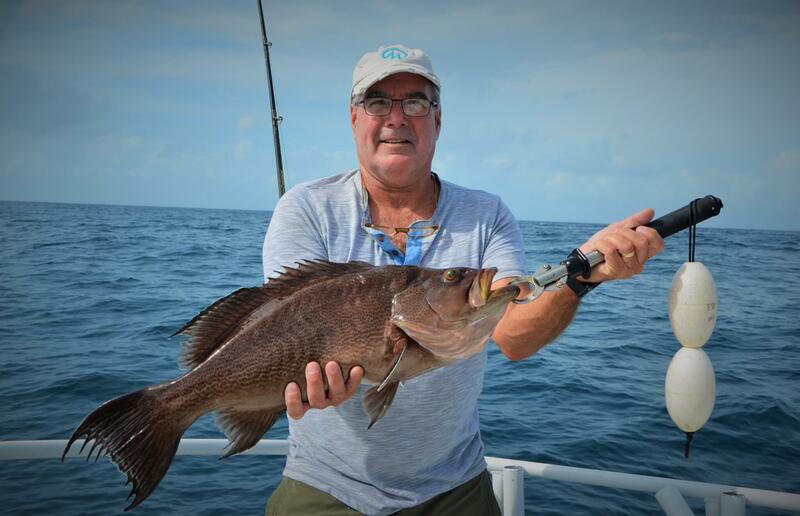 Bottom fishing remains strong with plenty of snapper & grouper action. 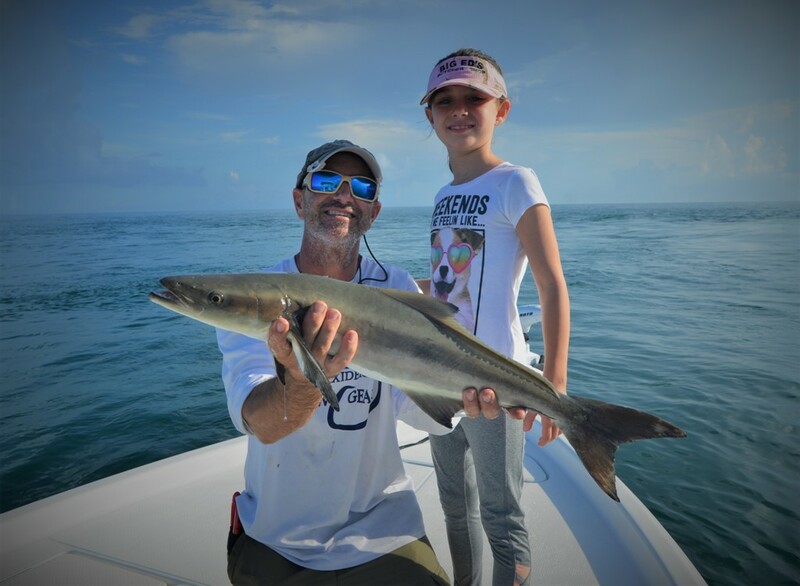 Some cobia are being caught on deeper reefs while bottom fishing when using larger baits or vertical jigging as well. Kingfishing has been steady in 60-140′ when trolling planers with ballyhoo with wire leaders an flashy seawiches.